Everyone else, scroll down and enjoy. 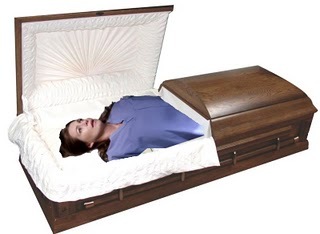 As many of you know, last week's Grey's Anatomy ended with the show's main character and namesake, Meredith Grey, flat-lining after falling off ferry and drowning. Everyone's hoping she'll pull through, but not me. I mean, call me crazy... but I'm really hoping she kicks it on tonight's show. Poor McDreamy... After finally picking her, choosing her, loving her... he ends up losing her. Oh, the heartache! How would he move on? Would he throw himself into his work, snagging the chief position in the process? Would he retreat into himself and live inside his head as much as Meredith does now? Would he run into the arms of Addison? A tragedy like this would really give McDreamy a chance to show off his acting chops. I smell Emmy. And what about George? Sure, he's married to Callie now, but he loved Meredith at one point. Would his grief get the best of him and jeopardize his marriage? And the others... Who would Cristina talk to about her problems with Burke? Would Izzie be able to handle another loss so soon after the Denny tragedy? Would McSteamy be able to forgive himself for not trying harder to shag her when she was alive? Would Alex? I don't why I'm allowing myself to worry about all this. I mean, we all know she's gonna pull through. There's no way the writers/producers would kill off the show's main character. Doing so would be on par with having Roseanne win the lottery or Felicity cutting off her hair - it would go down in television history as one of the dumbest things ever. No, in about three episodes Meredith will be back to her normal self, back to whining about not being loved, which is precisely why I don't watch a lot of network television - it's too freakin' predictable. But still, it's fun to imagine and I don't see why they don't at least try it. This season is boring. The girl got the guy in season three. Where do they go from here? If ratings plummet, they can always pull a Dallas and pretend the whole season was a dream, like they did when Bobby died. Anyone with me? UPDATE: This post was linked to from Jossip. Thanks guys!